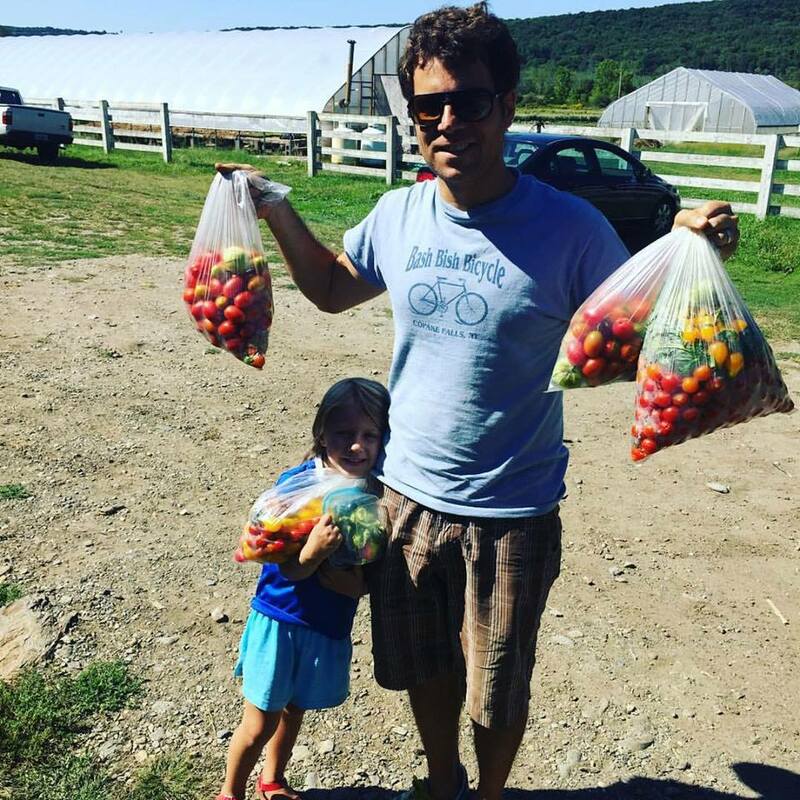 Community-Supported Agriculture is a direct partnership between farmers and their community. Members buy a share of the harvest up front, before the growing season begins, and then receive a weekly bounty of vegetables and/or flowers between June and November. Providing our community direct access to FRESH, LOCAL, AMAZING TASTING food and BEAUTIFUL, LONG-LASTING flowers is part of why we farm! 100% of your food dollars go to our farm & farmers! All other buying platforms take a percentage, often 20-30%, that does not go to the farmer, but to the middlemen. In some cases the food passes through three or four hands and is shipped around the country to make it to the door of the customer. The CSA model connects farmers directly to consumers. Farming is high risk, when a greater percentage of the food dollar goes directly to farms, it helps them to pay their workers fair wages and create a more resilient farm. The CSA model immediately creates a supportive relationship between us, the farmers, and our members that is unique to how food and flowers can be purchased. We have a direct connection to the people that are benefiting from our food and flowers, and who are supporting our business. In a climate where we are less informed about where our food and flowers come from, this type of relationship is vital. In a short time, trust and commitment between farmer and member can grow immeasurably. Have a question about a food in your share or how it was grown? Send us an email! It is that easy. The funds received ahead of the season allow the farm to operate in the months that no income is generated through sales and enables the farm to buy seeds and equipment. Being a small organic farm is challenging, so the CSA model allows the business of growing food and flowers much more sustainable. The farm supports the families and, in turn, the families support the farm. Our CSA provides our members the choice to pick up their share on the farm, where they get to experience the farm, farmers and the beautiful surrounding landscape first hand. Our on site pick up includes a U-Pick of herbs, beans, peas, cherry tomatoes, and more! It is affordable! Each week our shares are abundant! We offer our produce below farmer’s market and organic grocery store prices. Feed a family of four for just $25-30/week! Additionally, we offer the option for people to pay in installments or using EBT if paying for the total share up-front is prohibitive. Families get to try new produce and recipes! Our weekly newsletter not only gives people an update from the fields, but also a list of what is in the share that week and fun recipes.